On April 7th, 1955, the house of a British commander was bombed. The house was damaged. It is reported that pamphlets with the signs of EOKA were found on the streets of Nicosia. Terrorists are directly threatening the police, saying that they will punish the traitors like they will reward those who support their struggle. The police is occupied with the mystery of the boat, which was lost in the Famagusta harbor on the first day of the terrorizing movements (April 1st), and then found thrown in the coast. The police investigates to decide for what purposes the boat could have been used. 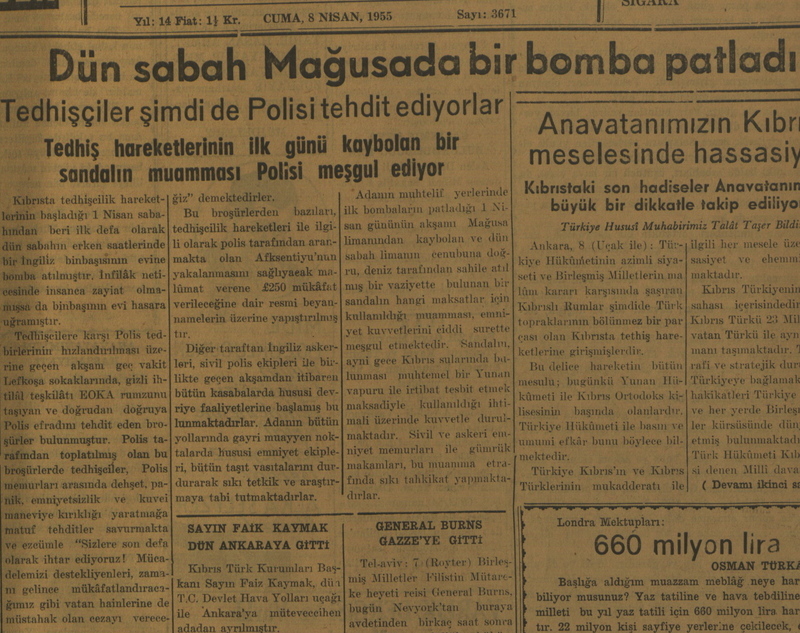 R.H., “Report on bomb explosion in Famagusta on April 7, 1955,” Cyprus Critical History Archive: Reconsidering the culture of violence in Cyprus, 1955-64, accessed April 25, 2019, http://ccha-ahdr.info/items/show/11. This initiative is part of the AHDR’s Multiperspectivity and Intercultural Dialogue in Education (MIDE) project, which is supported by the United Nations Development Programme – Action for Cooperation and Trust (UNDP-ACT) and implemented by the AHDR.